It’s a little different from the method I’ve always used so I’ll be very interested to try this and see if I get nice, shiny, beautiful yellow yolks like your picture. I’ll let you know! This is the recipe I always use and they turn out great. Let me know what you think. By Golly, you were right! I got Brilliant Shiny Yellow Yolks! They were a thing to behold! Amazing, isn’t it? 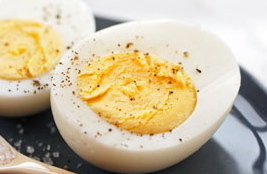 Hard boiled eggs will never be green again.